We hope you had a great Christmas! We had grilled elk prime rib. A backstrap on an elk is over three feet long. 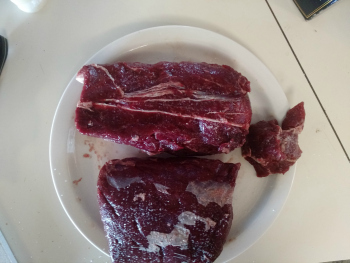 A deer backstrap is shorter, but both have a "prime rib" or ribeye section. That section is the most tender and has practically no connective tissue in it. The rest of the "backstrap" is not nearly the quality of the area from the 4th through the 12th ribs. See Chef John McGannon's (Wildeats Enterprises) Hunter's Meat Map. for an illustration. I am always careful to make sure we know where this section is, so we can label it properly. Yes, I count the ribs. If I end up taking the backstrap off the animal before packing it out, I make a cut marking the beginning (toward the front) at the 4th rib, and the end at the 12th rib. I still leave the strap intact, but my two cuts make it easy to tell where the prime is. Starting with the hip bone up to between the last two ribs is the strip loin, or New York strip. These make good steaks or roasts, too, but don't have the "pure meat" quality of the prime. You will see some connective tissue. In fact, there is a separation there on some of this part of the strap. This cut will sometimes just separate during cooking at that connection. I ofte just cut along that line before grilling it into steaks. The top cut in the picture below is the NY section. The bottom is the prime rib of the same elk. I cut a small tip off the the NY in order to square it up. The small pieces will burn quickly and make the roast look less attractive. No matter what the cut is, wildgame doesn't have to be dried out. Any meat that is cooked medium well or well done, will have very little juicy tenderness. 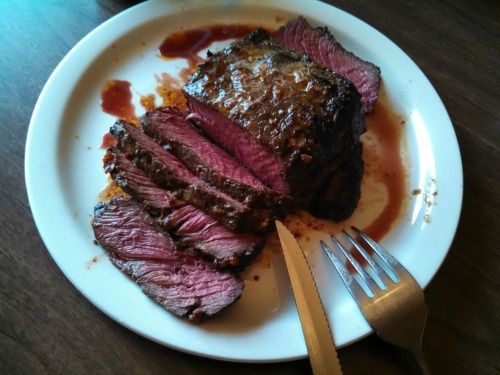 The most tender and juicy is meat that is bright red (medium rare, cooked to 130-135 degrees internal). Rich pink (medium, cooked to 125-145 degrees) will still be juicy and still pretty tender. Check out our Grilled Venison Roast Recipe and Elk Steak page. 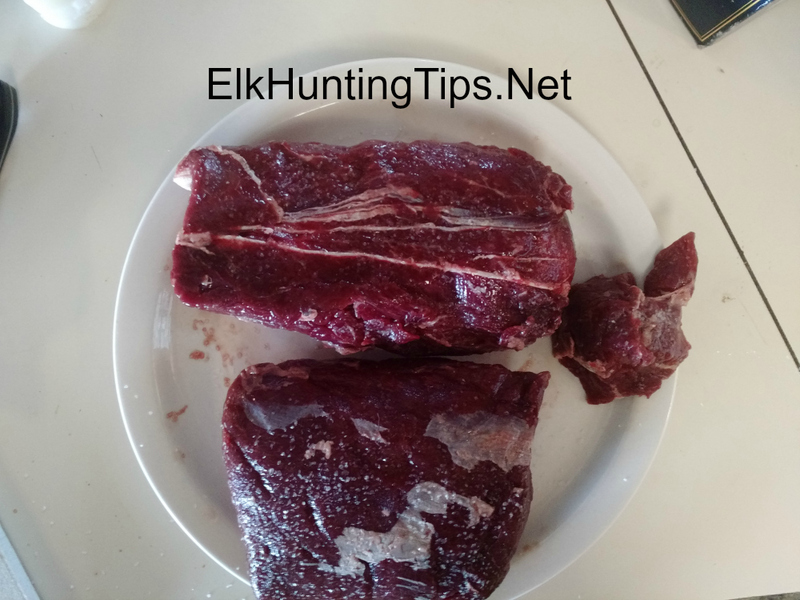 I've described the procedures, temperatures and seasonings to make any steaks or roasts delicious, with a nice borwn outside, but juicy interior: beef, elk, venison, etc.